Krzysztof Kieslowski's international breakthrough remains one of his most beloved films, a ravishing, mysterious rumination on identity, love, and human intuition. Irène Jacob is incandescent as both Weronika, a Polish choir soprano, and her double, Véronique, a French music teacher. Though unknown to each other, the two women share an enigmatic, emotional bond, which Kieslowski details in gorgeous reflections, colors, and movements. Aided by Slawomir Idziak's shimmering cinematography and Zbigniew Preisner's haunting, operatic score, Kieslowski creates one of cinema's most purely metaphysical works. 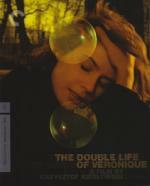 The Double Life of Véronique is an unforgettable symphony of feeling. This is a lyrical, rich, beautiful film about the interconnectioness of human beings. I must agree with Roger Ebert, this is one of the most beautifully filmed movies I have seen. The cinematography, lighting, color, are all exquisite. Kieslowski himself said the film is about "the inner life of a human being" and that's as good a description as any. This is poetry, if poetry is visual. It's moody, atmospheric and hypnotic. It draws you in, like any great work of art. It's a dream, a story about the soul of a woman, of two women, of all of us. Irène Jacob does a spectacular job as Veronique/Weronika. She basically has to carry the entire film and does it splendidly, pulling off two distinct people who must also be the same person. No wonder she was honored at Cannes for this film. Of course, it should go without saying after that paragraph that this is strictly for the art-house crowd. Blockbuster fans should steer clear, you'll find it much too slow and opaque. We should go back to Estonia for Sugisball but we had greater success in watching films when we were going through Africa by jumping around rather than sticking to a set order, so I think we're going to go back to jumping. So, next up, East Germany! Filmed in menacing black and white, this rare noir classic from the legendary DEFA Film Studios is the East German answer to Fritz Lang, Alfred Hitchcock and Carol Reed's The Third Man. A train station inspector witnesses a robbery, and recognizes one of the thieves - but hides this fact from the authorities. Meanwhile the thief sets his partner after the inspector's daughter, setting in motion an explosive unearthing of dark secrets from the Nazi era. This is a tightly scripted little film noir mystery. The mystery isn't the usual sort, like a murder or crime, but the mystery of secrets and the past. Why would a man not identify a man he recognizes as a thief? What is he hiding, and why? The film keeps you on the edge, wondering what it is until the reveal, though knowing the background and the years gives one a suspicion of what might be involved. This is a thought-provoking film, and a film that wrestles with guilt - both the guilt of the individual and society, of what is done and what is not done, and how we cannot escape our guilt by burying it with lies. Truth needs the light of day to conquer guilt. Beautifully filmed in black and white, with excellent use of light and shadow, and with an eerie, dissonant soundtrack, Das zweite Gleis stands up nicely with the best film noir, and is recommended for any fans of the genre. I think we'll stay in Germany for a bit, and watch a film made since Germany was reunified, so since 1990. We've seen Mostly Martha and Schultz Gets the Blues (both are good), so we'll watch one of the others. I'm thinking it's going to be Run Lola Run. A thrilling post-MTV, roller-coaster ride, RUN LOLA RUN is the internationally acclaimed sensation about two star-crossed lovers who have only minutes to change the course of their lives. 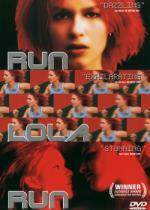 Time is running out for Lola (Franka Potente). She's just received a frantic phone call from her boyfriend Manni (Moritz Bleibtreu), who's lost a small fortune belonging to his mobster boss. If Lola doesn't replace the money in twenty minutes, Manni will surely suffer severe consequences. Set to a throbbing techno score, "Lola's like a human stun gun!" - Peter Rainer, New York Magazine. We all know Bugs Bunny should have taken that left turn at Albuquerque. But what if he had? Things would have turned out very different. That's the basic premise, and theme, of Lola Rennt. What effect do Lola's actions have on the future? What is the role of chance? Of luck? Can you hit the reset button and give it another go? And what would happen if you could? It's a fun, fast paced film, done with technical skill and lots of "gimmicks" - animated sequences, speed ups and slow downs, split screen. I really liked Franka Potente's portrayal of Lola, though I did wonder what she saw in Manni. You don't really learn a lot about him, about what makes him the guy for her that she is willing to do all this for. But maybe you don't need to. It's still a good film. Recommended. Okay, we're going to continue to stay in Germany for a bit, and hit the way-back machine to visit The Weimar Republic - so Germany before 1933. I have a reasonable selection of films from the time period as well. I marked the ones we've seen with an asterisk. I really want to watch Metropolis, but I don't think we'll have time before it's time for Christmas movies (seeing as it's a 2 1/2 hour film, and there's not enough time for that during the week), so I think we'll try to watch People on Sunday. Years before they became major players in Hollywood, a group of young German filmmakers—including eventual noir masters Robert Siodmak and Edgar G. Ulmer and future Oscar winners Billy Wilder and Fred Zinnemann—worked together on the once-in-a-lifetime collaboration People on Sunday (Menschen am Sonntag). This effervescent, sunlit silent, about a handful of city dwellers (a charming cast of nonprofessionals) enjoying a weekend outing, offers a rare glimpse of Weimar-era Berlin. 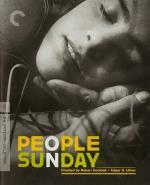 A unique hybrid of documentary and fictional storytelling, People on Sunday was both an experiment and a mainstream hit that would influence generations of film artists around the world. This was a fascinating movie. While a worthy enough film on its own, it's most interesting as a document of Weimar era Germany. The look at Berlin in 1929, of her people and her robust public transport is a wonderful historical document. I was reminded of Man With a Movie Camera in that the film documents the people and their city. Of course, it doesn't have the camera tricks that film did, and adds a story that we follow as well as the documentary footage. Without the camera tricks the film feels much more realistic. It has a carefree, summery feel, spontaneous and unpretentious. Yet I agree with the view offered in the accompanying documentary, that it is ultimately cynical about the relationship between the sexes, since Brigitte desires to see Wolfgang again next Sunday, but he has plans with his buddy for soccer. Having gotten what he wanted, he has no desire for anything further. Worth watching for the wonderful camera work, the interesting historical Berlin, the nostalgic atmosphere, and the film history connections. Five of the people working on the film went on to do very well in Hollywood (Wilder, the Siodmak brothers, Ulmer & Zinnemann). It's now time for Christmas movies, but when we get back next year I think we'll go to Czechoslovakia. We also have The Ossuary and Other Tales, which is a collection of animation from Czech filmmaker Jan Svankmajer. We've watched that, however, so I think we'll probably watch Daisies. Maybe the New Wave’s most anarchic entry, Vera Chytilová’s absurdist farce follows the misadventures of two brash young women. Believing the world to be “spoiled,” they embark on a series of pranks in which nothing—food, clothes, men, war—is taken seriously. Daisies is an aesthetically and politically adventurous film that’s widely considered one of the great works of feminist cinema. This was an interesting film. What I got from it was it's points about the condition and place of women in society, how women are not truly seen or understood, and are locked out of full participation, leading to absurd spoilage. Another point the film has is how asking for help leads to continuing a broken system and therefore the only way to truly achieve help is to help oneself. It would be a really interesting film to use in a college class to analyze from various theoretical perspectives. I don't regret watching it. I also think it unlikely that I will ever watch it again. It had absolutely no story, moving from scenario to scenario with little (or no) transition or logic, and was completely absurd. I think the director intended this, that pure absurdity is what she wanted to achieve, and in that she was successful, but that doesn't necessarily make for a film that is rewatchable. Also, while the women were active and central to the film, the film's entire focus, all they really did was live off manipulating men and gorge themselves on pleasures. Yes, the point I think was that because women are spoiled by society (in the sense of spoiled food) then why should they not spoil themselves (in the sense of a spoiled kid), but this doesn't ultimately enact change. I can't think of anyone I could recommend this film to, outside of that one usage I mentioned above. Art film - yes, experimental film - yes, good film - not so much. I think we might try watching our Slovenian film next, which is Spare Parts. I didn't think as much of it as Danae did. Well... lets put it this way... it didn't take long for it to put me off to slumberland. Okay, we went to Romania instead. I have four films from Romania. Unfortunately, we watched 12:08 East of Bucharest. ON THE SIXTEENTH YEAR ANNIVERSARY of the fall of Romanian dictator Nicolae Ceausescu, a local anchorman of a nearby provincial town invites two of his acquaintances to share their moments of revolutionary glory on his talk show. One is an impish, insightful retiree who sometimes poses as Santa Claus, the other a henpecked, hard-drinking teacher who has just devoted his entire salary to his drinking debts. Together they will remember the day when they stormed their town hall calling "down with Ceausescu." Or did they? Maybe this is a film that plays better in it's home country, because this was the most boring film I've seen in several years. At a mere 85 minutes, this film was tediously long and we debated shutting it off. Nothing happens in this dreary little movie except to establish that the revolution may, or may not, have happened in this little town. If this is a comedy, it's an awfully bleak one with few moments of humor. The characters are reasonably fleshed out and the actors do a good job, but the only likeable character was Mr. Piscoci, and he didn't have nearly enough dialog. I wouldn't mind seeing Mr. Piscoci in another film, as that character was interesting and amusing and is responsible for all the 1 and a half stars I'm giving the film. Recommended for no one and I wouldn't watch it again. Maybe this is a film that plays better in it's home country, because this was the most boring film I've seen in several years.